As the temperature drops, many obstacles associated with the season’s change begin to arise for homeowners and builders. LiteForm Technologies has a solution for those seeking to protect their home’s foundation during the cold months of winter. LiteForm has produced some of the highest quality insulated concrete form (ICF) products for homes, commercial buildings and decks. A frost protected shallow foundation is a practical alternative in cold regions with seasonal ground freezing and the potential for frost heave, saving customers time and money. Standard foundation footings are typically placed below the frost line, which is about 4-feet deep in the northern United States. These deep walls protect the construction from freezing, cracking and heaving, however a lot of time and money can be wasted throughout the process. The company’s shallow foundation forms, known as LiteFoot, simplify the building process and save thousands of dollars, with a guaranteed long term performance. In comparison to standard footings, LiteFoot is fully encapsulated by FlexxBoard25 Industrial Insulating Board, supplying additional stability and insulation from frost. If the ground can’t freeze on top, then the ground won’t freeze below since soil is a constant 55°F. 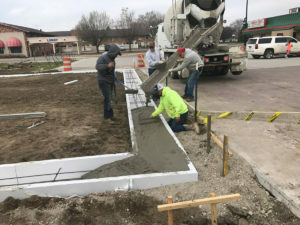 LiteForm’s shallow foundation forms have been used in dozens of Northern regions of the United States, including several projects along the Canadian border, enduring sub-zero temperatures without fail. Individuals looking to learn more about LiteForm Technologies are encouraged to visit their official website at www.liteform.com or follow the company on Facebook at www.facebook.com/liteformtechnologies.